There are 65 Assisted Living Facilities in the Deerfield Beach area, with 6 in Deerfield Beach and 59 nearby. The average cost of assisted living in Deerfield Beach is $2,630 per month. This is lower than the national median of $3,346. Cheaper nearby regions include Pompano Beach with an average starting cost of $2,342. To help you with your search, browse the 422 reviews below for assisted living facilities in Deerfield Beach. On average, consumers rate assisted living in Deerfield Beach 3.9 out of 5 stars. Better rated regions include Boca Raton with an average rating of 4.1 out of 5 stars. Caring.com has helped 5 families in Deerfield Beach find high-quality senior care. To speak with one of our Family Advisors about assisted living options and costs in Deerfield Beach, call (855) 863-8283. Deerfield Beach is named for the numerous deer that once grazed along the Hillsboro River. With a total area of 13.4 square miles, Deerfield Beach has six assisted living facilities (ALF) within the city limits and 56 nearby. ALFs in Florida can range in size from one resident to several hundred and are regulated by the Department of Elder Affairs. The Bureau of Health Facility Regulation licenses several types of ALFs: standard care, limited nursing services, age-in-place facilities and limited mental health care. Living in Deerfield Beach is somewhat cheaper than other areas of the state or country, with an overall cost-of-living score of 97 in comparison with Florida's 101 or the United States' 100. Because the cost of living is slightly lower in this city, seniors should consider Deerfield Beach when desiring to spend less money on food and housing and more on recreation and transportation. Weather in Deerfield Beach is warm and sunny, with temperatures ranging from a low of 58 in the winter to 90s in the summer. Deerfield Beach is a great option for seniors seeking a stable climate and nearly year-round sunshine. Not only are there no state or local taxes in Florida, but the state also excludes Social Security and pension income from taxation. With less money spent on taxes, seniors can spend more money on assisted living costs in Deerfield Beach. Deerfield Beach is ranked higher than the national average for violent and property crime rates by ten points, perhaps making it a more dangerous option for senior living. The Deerfield Beach area is home to world-class medical facilities, including Deerfield Beach Health Center and Boca Regional Hospital Urgent Care, in the event of medical emergencies or illness. The air quality in Deerfield Beach is exceptionally good and is scored at 75, as opposed to the national average of 58. This could be a significant factor in determining which ALF to choose if seniors plan to spend a lot of time out-of-doors. Assisted Living costs in Deerfield Beach start around $2,863 per month on average, while the nationwide average cost of assisted living is $4,000 per month, according to the latest figures from Genworth’s Cost of Care Survey. It’s important to note that assisted living rates in Deerfield Beach and the surrounding suburbs can vary widely based on factors such as location, the level of care needed, apartment size and the types of amenities offered at each community. 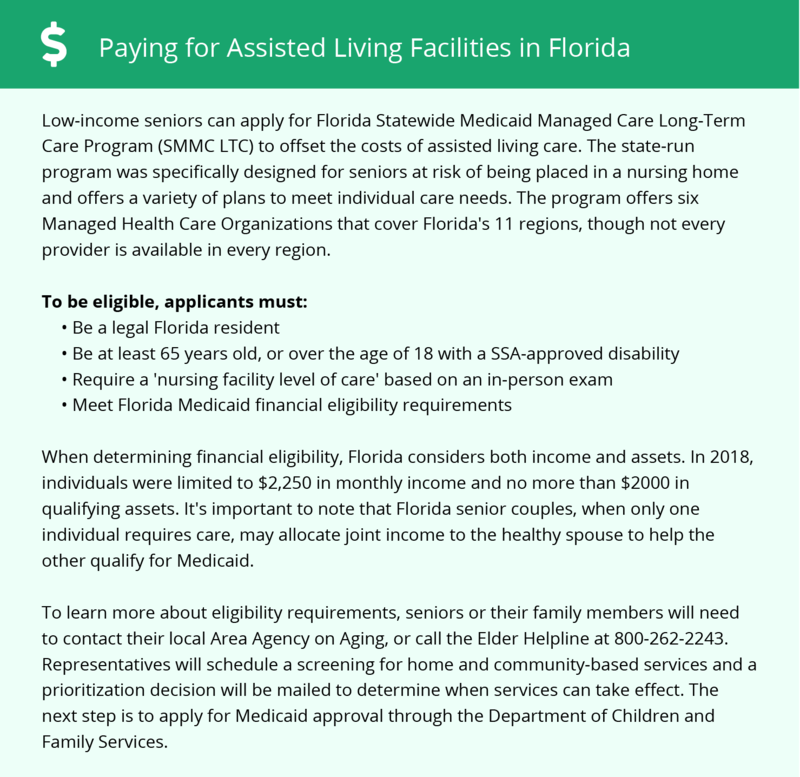 Eligible seniors can receive financial assistance in paying for ALF costs using the Florida Statewide Medicaid Managed Care Long-Term Care Program (SMMC LTC). In addition, the state of Florida covers specific services in ALFs with a standard or specialty license under a statewide 1915(b)(c) MLTC program if participants are offered a private room, private apartment or unit that is shared only by consent. Deerfield Beach and the surrounding area are home to numerous government agencies and non-profit organizations offering help for seniors searching for or currently residing in an assisted living community. These organizations can also provide assistance in a number of other eldercare services such as geriatric care management, elder law advice, estate planning, finding home care and health and wellness programs. To see a list of free assisted living resources in Deerfield Beach, please visit our Assisted Living in Florida page. Deerfield Beach-area assisted living communities must adhere to the comprehensive set of state laws and regulations that all assisted living communities in Florida are required to follow. Visit our Assisted Living in Florida page for more information about these laws.